So selling and buying a house turns out to be just as hideous and stressful as people say it is and it has certainly taken a toll on me mentally and physically. From eating every single feeling to never sleeping, my skin has taken the brunt of it all and was looking less than clear and bright recently. 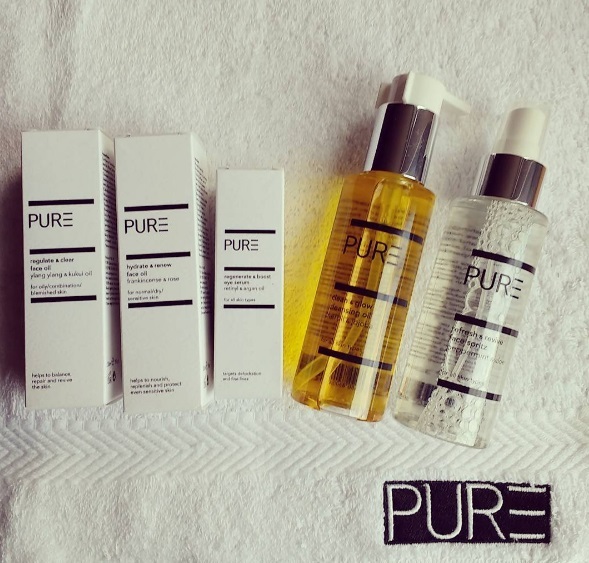 Handily for me Pure Spa sent me along some of their brand new shiny at home spa products to try out, and they have been a savior in these crazy times. With no harsh chemical, parabens or irritating foaming ingredients, this cruelty free capsule collection is instead loaded with regenerating pure plant oils and antioxidants which were ideal for calming my skin, never mind being a joy to apply! Ranging from £14.50 to £32, the collection contains 5 products including cleansing oil, eye serums and refreshing spritzes that all smell divine. I adore using facial oils and have found that they have really improved the texture of my skin with continued use. 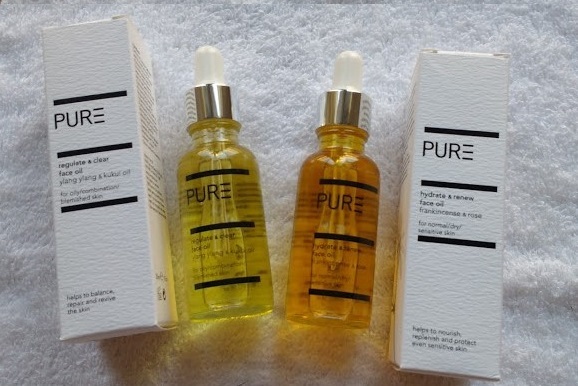 I do find that my skins need do change a lot however so the Pure Skin range offering one for oily and blemished skin, and one designed to rehydrate, is an ideal combo. I flick between using the two and have loved both. The Regulate and Clear option is loaded with Omegas to help heal while still providing gentle rehydration too with Vitamin E, the added rosehip is also fantastic for old scarring which has made my skin look more even and clear. The Ylang Ylang is the key ingredient that help balances the sebum which causes my usual spots but also serves the purpose of really boosting the mood with its exotic aroma, it is so lovely! The Hydrate and Renew oil has rose, geranium and orange so obviously smells incredible as well as frankincense which helps regenerate the skin cells and actually promotes deeper sleep through relaxation. This element of it has been so welcome with all my sleeping troubles in the last two months, I love applying this at night and inhaling as I take my time massaging it in. this little beauty is so moisturising, I wake up with much more rested complexion that is so so soft. Wonderful Stuff! My other favourite from the bunch is the Clean and Glow Cleansing Oil which has been ideal for removing the thicker spfs I have been using in the summer. This deeply cleansing formula really melts away my makeup through the jojoba oil while still utilising Vitamin E and Neroli to calm and balance the skin. I have been massaging just one pump over my face and removing it with a nice warm face cloth. It feels a wonderful routine and my skin has been reaping the benefits of sticking to it. There has no been no film or residual left over after using this, and it works just as well in the AM as at night. So far, so happy!! 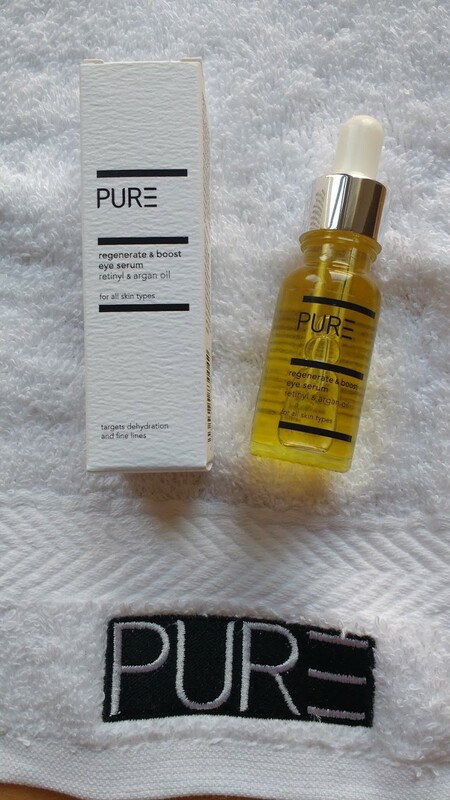 The clever bods at Pure have included an Eye Serum and Refresh and Revive face spritz that I have used less so can’t fully report but I have been just as impressed. I like the alcohol free spritz as it doesn’t leave me feeling tight and dry and has been a lovely pick me up for during the day. The eye serum is light to apply and I like the consistency, I am just useless and remembering to apply regularly!! In all, this is a lovely little collection that Is well thought out, packaged and priced. Right now if you spend over £40 on the products you get a lovely free gift of a tote bag with miniatures, a cloth and a £10 voucher for your next Pure Spa facial which is ace! !